Gas-pumping robot replaces boring job for humans | PinOy SPY! Dutch inventors unveiled Monday a 75,000 euro ($111,100) car-fuelling robot they say is the first of its kind, working by registering the car on arrival at the filling station and matching it to a database of fuel cap designs and fuel types. 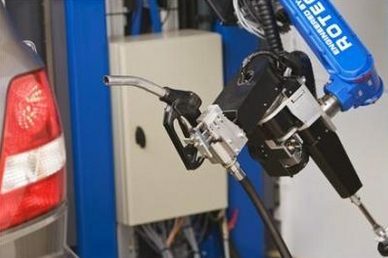 A robotic arm fitted with multiple sensors extends from a regular petrol pump, carefully opens the car’s flap, unscrews the cap, picks up the fuel nozzle and directs it toward the tank opening, much as a human arm would, and as efficiently.